Play Mats (Opportunity 6) – Verdict: Winner! Card Sleeves (Opportunity 8) – Verdict: Loser! Magic Dice (Opportunity 6) – Verdict: Winner! Abacus Life Counter (Opportunity 5) – Verdict: Loser! Okay, it’s time I let you guys in on a little secret. I’m a nerd. Shocking, I know. Yep, that’s right. I’m a full on Geekasaurus Rex. I spend my Saturdays dungeon-mastering D&D. I own no less than 8 Doctor Who t-shirts. And recently I’ve started playing Magic: the Gathering with my son. If you aren’t familiar with Magic: the Gathering, it’s a collectible card game where you and another player are wizards battling each other with spells. And it’s very popular. According to this article from 2016, Hasbro, the company that owns Magic: the Gathering reported that they had over 1,000,000 players registered in their database. And 65,000 of those actually played competitively. So it’s a pretty big market! Furthermore, Magic: the Gathering is one of those hobbies where its players obsess about it. It’s not uncommon for individual cards to sell for 2-3x more than what the actual package they were found in cost. In fact, Magic: the Gathering is pretty much the cornerstone of any hobby store in the US; it’s literally what keeps a lot of those stores from shuttering their doors. TL;DR Magic: the Gathering is profitable and has a strong following. But Dave, what about intellectual property? Great question! The products that we’re going to look at won’t actually be the cards themselves. Nor will they be branded with Magic: the Gathering, Wizards of the Coast, or the Hasbro trademarks. Instead, they’ll be somewhat generic products related to the niche. If they work out, the goal would be to position them to Magic players and hopefully jump on Amazon searches for those keywords. How do I come up with Amazon FBA product ideas related to Magic: the Gathering? The best way to start coming up with product ideas related to a niche market is to use the Jungle Scout Web App. Personally, I start with Keyword Scout. All I have to do is open the app, put in “magic the gathering” into the search and see what it puts out. I also did a quick search on a popular hobby website, Miniature Market, and found another cool product idea: abacus life counter. So let’s see whether or not we can make money selling Magic: the Gathering accessories! Remember: While I do my best to arm you with the data you need to make good product decisions, there’s always the potential that the product may not work out. This material is meant for educational and entertainment purposes. Always do your own research. 77 average units in sales per month. Not the highest sales in the world, but this is without removing any sort of outliers, so that’s not too bad. If we can get a minimum order quantity of 300 units on Alibaba, this could be a pretty good place to start. $17.44 average price. Awesome price, especially considering that these things won’t be too large. Lots of customization options. No two mats are the same. So there’s nearly infinite possiblities for expansion with just this one product. And I know that MTG players tend to buy more than one of these things. No products with “<5 sales.” So that means everyone’s selling at least a few per month. Decent demand! FBA fees are showing $2.99. That means it’s lightweight and easy to ship. Perfect. How much will these cost to manufacture? If we take a look at Alibaba, mouse pad suppliers are selling these for roughly $1.00 to $3.00. Roughly 650 of these buggers will fit on a 48″ x 40″ x 60″ pallet (using OnPallet for my estimations), but I only want 300 or so (looks like most of them go that low, too). So I’ll probably air freight them. So we’re probably looking at about $1.50 per unit in air freight DDP. That puts product costs at $3.50. I might also outsource a little artwork, so that might be another $100 to the total cost (one time). So for now the cost per unit will be $4.50, but that’ll go down on the next order. What will our profit margins be for this product? If we sell this product for $19.99, Amazon will take $5.98 in fees (15% referral fee and $2.99 FBA fees). After subtracting cost of goods, we’re left with $9.51 for profit and ads. The good news is that ads are cheap cheap cheap for keywords related to “mtg playmat.” Even Magic: the Gathering itself is only $0.38 for exact bids and $0.25 for broad. Plus there’s another 312 or so I can find in Keyword Scout. Plus, what’s stopping us from repackaging it as a large mousepad, too? Using the 2.5 Rule, at $0.25 per click, our ads will cost roughly $2.50. That means we should make an average profit of $7.01 per unit for a profit margin of 35%. Oo la la! Verdict: Slow sales, but high margins. You can expect to make roughly $6,500 per year selling these for a return-on-investment of 579%. I call that a winner. Note: this was the first product Keyword Scout popped out. I put it in Amazon, verified it with the Chrome Extension, and reviewed it in probably about 5 minutes. That’s $6,500 both those tools could potentially make me were I to launch a product like this. 131 average units in sales per month… kinda. This one is tricky. There seems to be two kinds of products here. The first are just plain cardboard boxes selling for less than $10. And the second are the bigger boxes like the one pictured that go for more. Plus there’s some leather, some wood. Make sure you’re matching up your products with similar before you assume that “one average units per months fits all.” For the purposes of this breakdown, I’m going to assume that my actual sales will probably be half of that. 23 average reviews. There was a lot of Ultra Pro stuff in this category. Ultra Pro is a licensed distributor for MTG stuff, so they can use the logos and IPs. Also, their stuff is super cheap. $20.55 average price. Because of the wide variety of options here, it’s hard to say that this is the real average price. It’s better to build our price off the product cost then, or at least similar products to what we plan on sourcing. Lots of customization options. Like the mats, there’s lots of room for customization. Magic players want to stand out, and nobody wants to use the same deck box as another Magic player. FBA fees are showing $4.18. The bigger boxes are going to be a little costlier to ship. So we better prepare for higher unit costs. Tricky product. With mats, while they had lots of different designs, they all were pretty much the same product. But with these they have lots of different options. I’m going to shoot for a product like the one pictured and see if I can make it profitable. Here’s the pickle. This is not an easy product to nail down on Alibaba. When I put in “mtg deck box” on Alibaba it came up with varied results. Plus, a lot of the minimum order quantities were 5,000+. At only 100 some sales per month, we’d be stuck with a ton of leftover inventory. So, instead of using “mtg deck box”, I did a search for “gift box” and came back with much better results and lower MOQs. Judging by the listings, my MOQ would be around 500 units. And the cost of the product itself runs between $2 – $3. Only 250 of these will fit on a pallet, so we’re looking at 2 pallets worth of inventory for roughly $2,000, or $4 per unit in shipping costs. $7.10 per unit is kind of pricey. But can we still make a profit with Amazon FBA product ideas like this one? If we price our box at $29.95, Amazon will take $8.67 in fees (15% referral plus $4.18 in FBA fees). That leaves us with $14.18 for ads and profit. Going back to Keyword Scout, I see that ads for “deck box” are kind of high, but we still have “magic the gathering” and a few others that we can promote for cheap. Let’s say average ad cost is around $0.50. Using the 2.5 Rule, that means we’ll spend about $5.00 per unit in ads. That leaves us with a potential profit of $9.18 for a margin of about 31%. Not too bad! My only reservation with this product is that there is so much diversity it’s hard to tell which products are winning and which are losing. Probably needs a lot more research on individual keywords before saying whether or not it’s a winner. Verdict: it could be a good product, but would require a lot of in-depth research and a lot of sourcing. There is the possibility of earning about $900 per month for an ROI of 400%. It’s not quite a winner or loser. 332 average units per month. Decent sales. Not bad at all. 31 average reviews. Same issue as before, Ultra Pro is all over the place in this category. $14.67 average price. This number is deceptive. Checking out one of the card sleeve sets priced at $19.99, I discovered with Keepa that the price was actually a lot higher than it normally was. I’m guessing that the average for 80-100 sleeves is somewhere around $8-$10. To get to the $20+ price range, you’re going to need to sell a lot of the sleeves all at once. I want to model our product on the guy selling 1,000 in one shot: $39.99. Lots of customization options. Not a lot of customization options like before, however, like the image above, you might be able to create a new card back design for the set. That could help your product stand out from the basic “transparent” cards. However, those may not be tournament-friendly for serious MTG players. FBA fees are showing $4.38. There’s one seller selling 1,000 sleeves at a time and making 204 sales per month. That’s the one I want to model on, because their price is at around $39.99. Another weird product to get into, but maybe we can make it profitable. Especially if we targer the larger volume of card sleeves? We’ve got to do a little math here because the Alibaba manufacturers are pricing these out by the sleeve and not the set. We want to sell 1,000 sleeves. And we want to try to start with an order of 500 of these. So that means we need to order 500,000 sleeves! Looks like they’re coming out to around $0.025 – $0.03 per sleeve for MOQs of 50,000. So since we’re 10 times that, I think it’s safe to say we’ll get the lower end of the range. So that’s $12,500 in product costs. Or $25 per set before shipping. YIKES! We can get 420 onto a pallet, so that means we’re looking at another $1,000 in costs, or $2.00 per unit. We might get a lower price because of the volume (possibly down to less than $0.01) but if that’s not possible, this is probably a big ol’ avoid. Amazon’s taking $10.38 right off the top. Then we’ve got that hefty $27.60 in product costs. That leaves us with only $2 to split between ads and profit. Verdict: this product is a stinker. Despite the Opportunity 8 score, the price is far too low and the costs way too high. Only massive producers can afford to sell stuff like this, and I suspect that they’re still using them as loss leaders for other products. Total loser. 244 average units per month. Decent sales. Not bad at all. 35 average reviews. Same issue as before, Ultra Pro is all over the place in this category. $14.68 average price. Most of the products on here are lower priced, similar to the card sleeves from before. The actual Magic dice doesn’t have a lot of competitors. The brand I pictured is selling roughly 200 units per month priced at $12.96. There’s a couple competitors (with fairly lousy listings, by the way) that are selling their products for a lot more and doing about 50 sales per month. FBA fees are showing $2.41. These products are super light weight and don’t take up a lot of space. Very easy to ship. Here’s another one of those Amazon FBA product ideas that requires a set. The picture up top has 12 dice. Looking on Alibaba, I’ve found someone that can make those exact dice for $0.21 per die at a MOQ of 200 total dice. We’re going to need about 400 sets (to be on the safe side), so that means we need a total of 4,800 dice. At $0.21 dice, that puts us at $1,008 in product costs. 400 sets probably won’t be expensive to air freight. I’m going to go out on a limb here and say it’ll probably be as low as $0.50 per set. Somewhat cheap. I suspect we can probably even get them cheaper–I actually know this as I’ve priced out dice a whole bunch of times, but let’s work a worst case scenario here. If we price our dice at $14.99 (very low… I don’t recommend ever going this low), Amazon will gobble up $4.66 of that (15% referral fee plus $2.41 FBA fees) and costs will take another $3.77. That’ll leave us with $8.81 to work with for ads and profits. We’re still in the same market, so ad costs will still run low, probably $0.25 – $0.50 per click. I think it’s doable. But you’re going to need some heavy keyword research since “magic dice” only snags a few hundred monthly searches. Overall, I’d guess you can probably make around $5.00 in profit per product for a margin of roughly 33%. Verdict: low price, so try to find a way to get your price up. But profitable. Possiblity of making $12,000 per year with a ROI of 895%. It’s a winner! 12 sales per month. Yeah, not too popular these. 0 average reviews. But at least there’s not a lot of competition, I guess? $18.20 average price. At least there’s some silver lining to this.. Reverse searching finds better products. The plus side of this stinker, is that sticking the term “abacus life counter” into Keyword Scout pulled up a bunch of better terms like “mtg counters.” Then, when I stuck those into Amazon it came back with an opportunity 7 product idea! It was the dice again (see above). I won’t go nuts with breaking this product out any further. Obviously, you can tell it’s not worth selling. Way, way too low demand for it. However, it did show us that the “magic dice” was still a safe bet and one of the better Amazon FBA product ideas on this list. 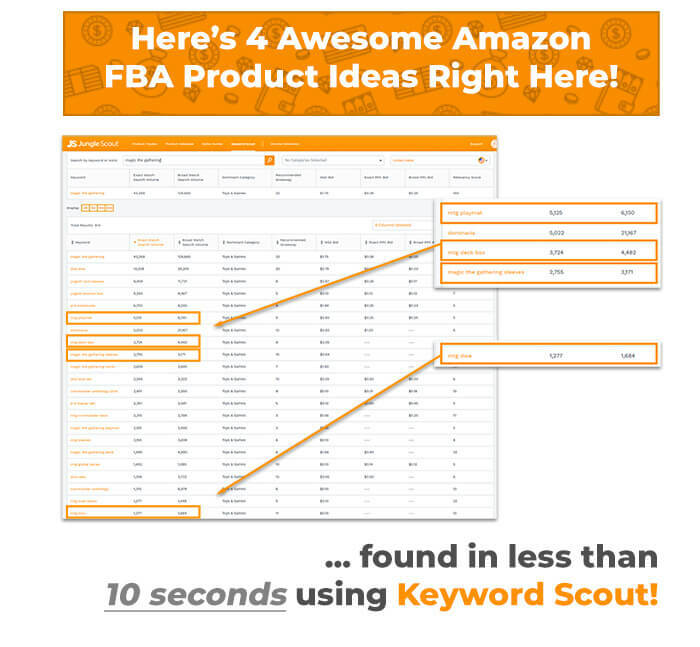 See you next time with more Amazon FBA product ideas! And if you need more product ideas, be sure to grab our list of 10,000 bestselling products on Amazon. Thank you for taking the time to write this article. We all want more of this because it breakdowns the math to knowing if a product is profitable or not. Paper and pen style. Keep doing this Dave. It’s a very useful to us rookies.